J'habite à Paris! : Wait, it's FRIDAY? Normally, when you get sick, you have one small consolation that you can roll around in your head: you don't have to go to work. In ideal cases, you are paid to stay home (i.e. sick time). Now, I'm not saying that I'm an advocate for abusing sick time - quite the contrary - but when you feel lousy, you look for a bright spot wherever you can find one. Of course, when you're at work, you console yourself by counting the days until the weekend. Finally, TGIF comes and you have the promise of two whole free days ahead of you. Today, I find myself saddened that it is Friday. I missed a whole week! And what's more, nobody missed me when I didn't show up anywhere! Very discouraging. Since I didn't really do anything this week, I'll instead post a few pictures that I took before and after the Paris Marathon. 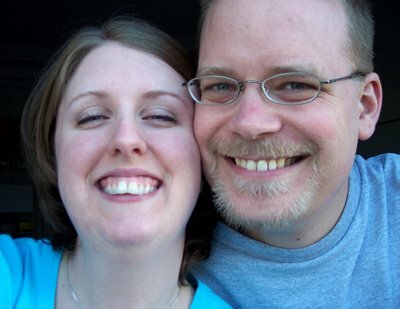 Here's a self portrait of me and Colin, just before my birthday (observed) party kicked off. We are facing out of the open window in our bedroom - the weather was gloriously warm. My "last meal," so to speak. 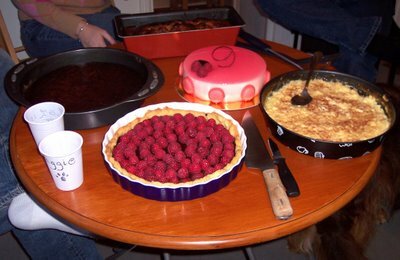 [Clockwise from the cups on the left: Muriels' chocolate/coconut cake; Muriel's apple, cinnamon, and nut bread; Doug and Stephanie's fruit cream cake; my Colin's family-recipe rice pudding; and Colin and Maggie's chocolate/raspberry pie.] I still can't look at desserts without feeling a little sick. Could this be the end of my love affair with sugary goodness?? Bum bum BUM! 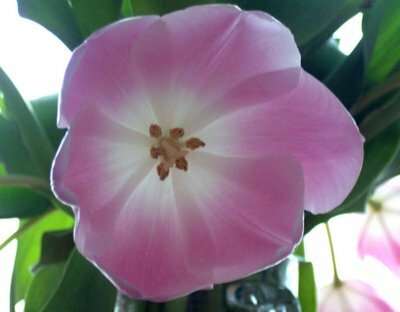 A closeup of one of the tulips that Muriel brought me. I think Colin took this picture for me on Monday, once they had really opened up. They were absolutely gorgeous for days. Poisson d'avril! 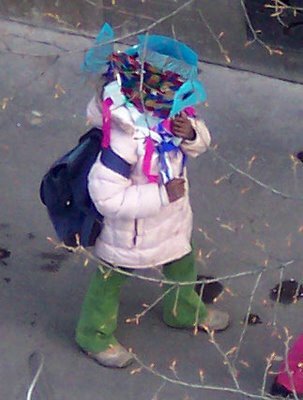 This little girl has on a full fish hat/mask that she must have made in school (there is an école maternelle across the street from us). I shot the picture from our window this afternoon.